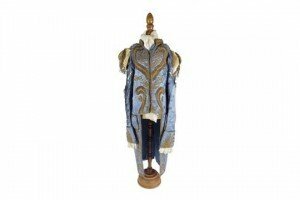 A Victorian child’s blue silk dress coat, with applied gold and metal thread and lace trimmed cuffs, with a cotton lining. 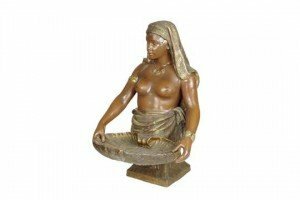 A Goldscheider pottery figure of a Nubian bare breasted woman, cast from a model by A. Rubelle, model no.896, modelled holding a shell tray, wearing a headdress and gold necklace, armband and bracelet, impressed marks and signature. An early 20th century 18ct gold opal and diamond ring, together with a diamond ring mount. The first set with three oval opal cabochons, with diamond point double spacers, together with a ring mount with rose-cut diamond border. Total weight 5.7gms. 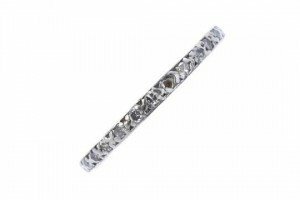 An early 20th century platinum diamond full-circle eternity ring. The single-cut diamonds, to the scroll engraved sides. 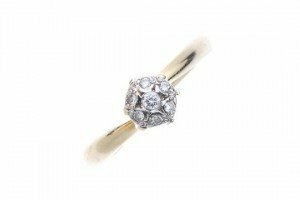 A diamond cluster ring. Of hexagonal outline, the brilliant-cut diamond, within a similarly-cut diamond surround, to the asymmetric shoulders and plain band. 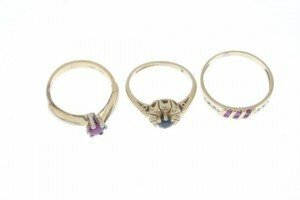 A selection of three gem-set rings. 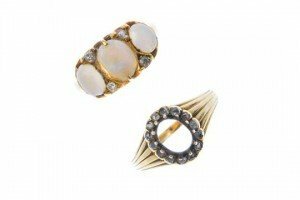 To include a 9ct gold circular-shape sapphire and single-cut diamond floral cluster ring, a circular-shape ruby single-stone ring, together with a circular-shape ruby and colourless gem dress ring. One with hallmarks for Birmingham. Total weight 8.3gms. A diamond three-stone ring. 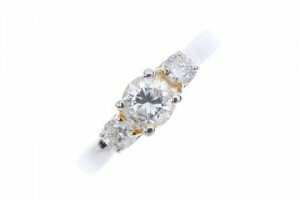 The brilliant-cut diamond, with similarly-cut diamond sides, to the plain band. Estimated total diamond weight 0.85ct. A late 19th century pique tortoiseshell brooch. 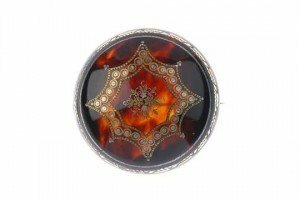 Of circular-shape outline, the domed tortoiseshell disc, with bi-colour geometric inlay. 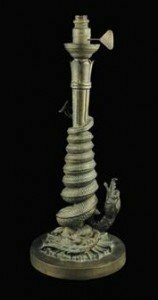 A William IV bronze lamp base, possibly based on a drawing by Sir John Flaxman, with traces of original gilding, the lappet stem entwined with a scaly dragon. 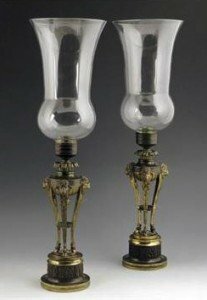 A pair of Regency gilt and patinated bronze figural candlesticks, hung with cut glass drops and lustres. 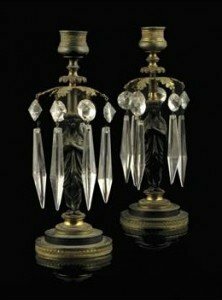 A pair of Regency gilt and patinated bronze storm lanterns, each with a later glass shade, above engine turned nozzles and tripod ram’s head monopodia supports, the socles cast with stiff leaves. 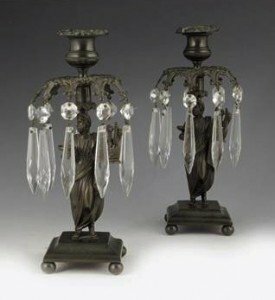 A pair of Regency bronze figural candlesticks, each with a classical male figure holding a lyre and cup, huing with cut glass drops and lustres, on ball feet. 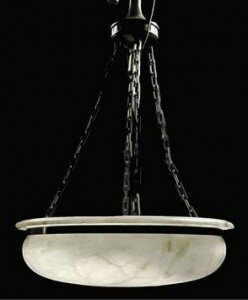 A carved alabaster ceiling light, suspended by four linked brass chains from a baluster and lappet mount. 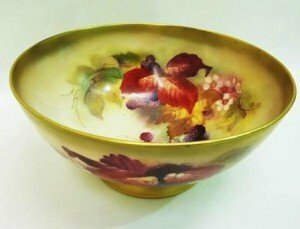 Worcester porcelain circular fruit bowl, the ivory ground decorated with blackberries, by Kitty Blake, signed, puce mark, dated 1926. 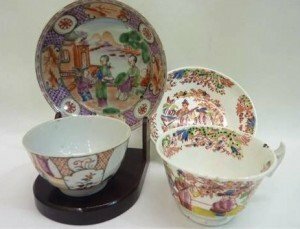 Late 18th century Chinese tea bowl & non-matching saucer, both with polychrome painted panels of figures surrounded by lattice borders with smaller floral & foliate panels; also an early 19th century English porcelain tea cup & saucer decorated with chinoiserie in polychrome enamels over iron red transfer; together with a small mahogany cup & saucer stand. 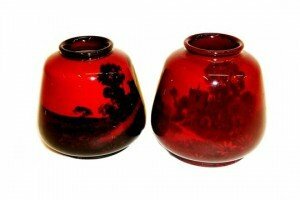 Two small Royal Doulton flambé glazed posy vases of squat baluster form decorated with a rural landscape. 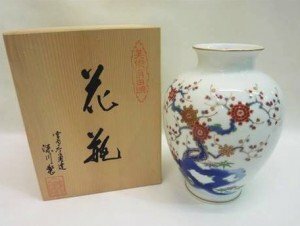 Japanese Fukagawa mid to late 20th century porcelain vase of baluster form, the white ground decorated with blossoming trees in iron red, blue, gilt & green, transfer mark & paper label, in original wooden box. 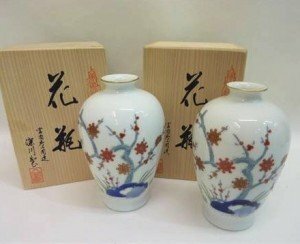 Pair of Japanese Fukagawa mid to late 20th century porcelain vases of baluster form decorated with a tree in blossom in a similar palette with under glaze mark, in original wooden boxes. 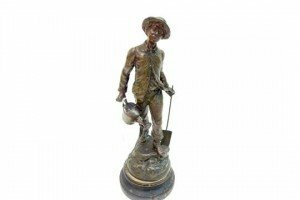 Late 19th/early 20th century patinated spelter figure of a gardener standing on naturalistic base holding a watering can & spade, signed Fuchs & mounted on ebonised socle plinth base. 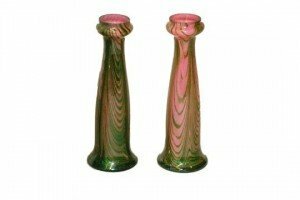 Pair of Art Nouveau style cased glass vases of slender form with metallic green striations on opaque pink ground.